There is a saying among fly fishermen that “you cast more with your left hand that with the right one” and for me there is a lot of truth in this. The left hand plays a very important role in all casting styles and in particular in our style it plays an enormous role. In our technique it can be used in three ways: a mini double haul (which should not be confused with the traditional double haul), a constant traction, and the hand kept still. So why is the left hand used in three different ways? Mainly because not all fishermen have the same style or the same sensitivity. For those who do not feel the tension in the line, a mini double haul helps a lot. It is also useful in certain styles like the totally under the tip cast. When you begin the backward cast, you will carry out the first mini traction downwards and just before the loop opens, our hand will have moved towards the stripping guide. Without stopping, you will carry out the second mini traction at the same time as the forward cast begins. Those who are more skilful, will usually keep the left hand still because they manage to keep the right tension with line speed and timing. One must be careful during the forward cast when the left and right hands get close to each other. This causes a loss of tension. Everything will be compensated by the velocity of the stroke and the line control. When the left hand is kept still, it should be kept around the belly in both the forward and backward strokes. The advantage is that you do not have to haul constantly as in the mini double haul while maintaining a good tension in the line. Some casting styles like the parallel or the superimposed casts require a constant traction by the left hand. Constant traction is a great way to use the left hand in certain specific styles. For example the parallel and superimposed casts work better with this method of tensioning the line. The hand will exert a constant traction on the line in such a way that the tension increases as the stroke progresses. You start by pulling down as soon as the back stroke starts and without stopping the left hand will continue until it is the moment to thrust. One thing is common to the three methods – a constant tension in the line between the left hand and the stripping guide. In other circumstances the left hand has another role, that is not to keep the line in tension but it can serve to achieve other desirable results. Let’s consider the superimposed cast. 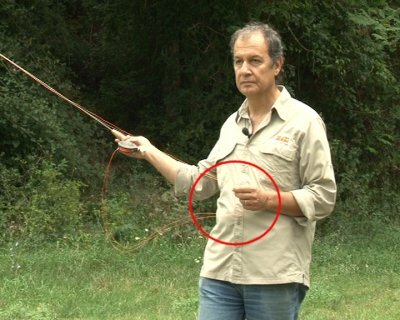 If you purposely release your left hand early, the result will be a drag free cast, if you release it a little later your fly will go under overhanging bushes delicately, landing like an airplane.